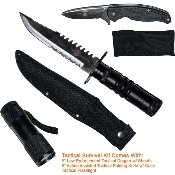 Looking for everything in 1 survival kit? We've got it! The included 8.75" dagger features a 5" blade with 3 serrations and "Law Enforcement" on the blade. The all metal handle features a Police emblem on the end cap. Unscrew the end cap to access the compass and survival kit inside the handle. The dagger includes a heavy duty nylon belt sheath. The spring assisted pocket knife is 6" overall with a half-serrated blade that reads "Law Enforcement". A pocket clip is on the handle. It also includes a nylon belt sheath. The super-bright LED flashlight is 5" and features 9 LED lights.